So you bought a compact tractor, now what? Now the fun begins: You get to pick the tools that will pair with your new tractor to help accomplish all types of tasks. Isn’t that why you invested in the tractor? To complete a job more efficiently and to give you back some of that precious time work and chores demand? Mowing, landscaping, grounds maintenance and even gardening is made easier with the proper tools. When picking implements, make sure they’re not only the right tool for the job, but also make sure they’re the right tool for your tractor. Keep in mind that bigger is not always better. Bigger implements require more horsepower and lifting capacity, sometimes more than your compact tractor may be able to deliver. Most implement manufacturers offer recommended horsepower ratings based on experience and testing in real-world conditions — make sure you follow those recommendations. Even something as simple as six tines on a three-point tiller can gobble up valuable horsepower! Read on and discover some of the more popular implements for compact tractors. The term “mowing” covers a broad range of tasks, and your compact tractor is ideal for accomplishing most of them, all as long as you pick the mower best suited for the task. Grooming mowers act like a traditional lawnmower. They feature lawnmower-style blades, discharge clippings either to the side or rear and have high blade tip speeds. Grooming mowers come in sizes from 48 up to 90 in., or for the largest compact tractors, three-deck models are available. Grooming mowers are best suited for campuses, sports fields or estates where turf appearance is important. Pastures, roadsides, pond dams and ditches are all places that a rotary cutter would feel at home. Rotary cutters, or rough-cut mowers, cut grass and small saplings. They don’t leave behind a well-manicured lawn but offer a cost-effective, grass-maintenance solution. They feature free-swinging blades and stump jumpers to protect the gearbox and driveline from the inevitable contact with immovable objects. Sizes range from 42 up to 84 in. A quality rotary cutter can cost $1,200 and go up to $3,900, while a grooming mower of similar quality starts at $2,400. Grooming mowers and rotary cutters are powered by the tractor’s power take-off (PTO). Power is transferred to the gearbox by a driveshaft. The driveshaft typically comes in one of two styles — slip-clutch or shear bolt — to protect the tractor from damage. Slip clutch models must be maintained and frequently “slipped” to ensure they function as intended. Shear bolt units require less maintenance but do require the operator to carry spare bolts to get back up and running. Another popular implement among compact tractor owners is a rotary tiller. Rotary tillers make seed bed preparation an almost effortless task. When choosing a tiller however, there are many options to consider — forward or reverse, chain or gear, slip clutch or shear bolt, just to name a few. The first option to consider is whether a forward or reverse till model is best for you. In most cases, a reverse till model leaves a more desirable seed bed, depositing larger clods on bottom and fines on top. However, reverse-till units are not recommended for rocky soil conditions. The reverse rotation brings rocks to the surface, and significant damage from rocks being pulled under the hood can occur. The tiller drive system is another option to consider. Rotary tillers are available as chain or gear drive and both types perform equally well. The real consideration is repairs, should they be necessary: chain-drive tillers are more easily repaired on a weekend — many hardware stores can supply a chain and are open on Sundays — while gear-drive models can require significant downtime to get parts. Driveline options mirror rotary cutters — slip clutch or shear bolt — and are a matter of preference. Sizes vary by manufacturer but typically range from 42 to 74 in. Purchase a tiller that covers the tractor’s tire tracks. Even better, look for a model that offsets to more easily till next to fences or buildings. A quality, three-point tiller for your compact tractor can start at around $2,000 and go up from there depending on size and features. Plan on spending about $1,200 per foot on a seeder, considerably more for an over-seeder because of their precision. Popular among contractors are seeders. Several companies make seeders ideally suited for compact tractors. 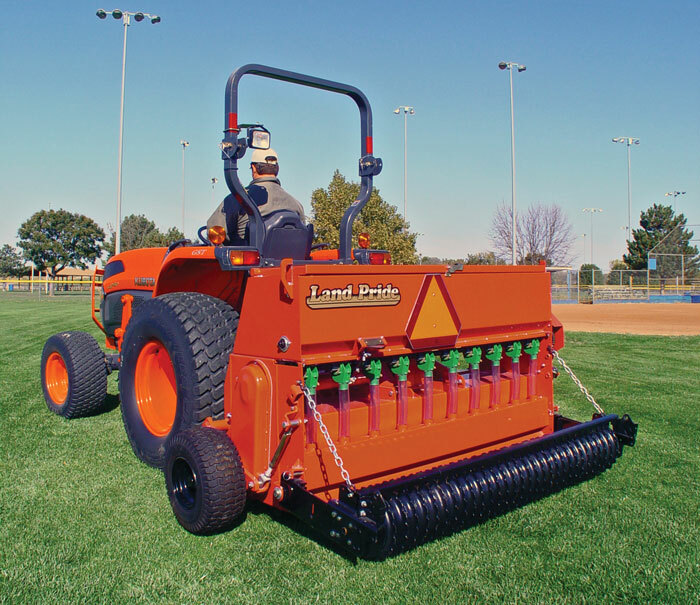 From all-purpose seeders that work in new soil, existing lawns, pasture renovations or food plots to seeders exclusively suited for new lawn seeding and over-seeders that do just that (they over-seed), there are a host of options to consider when buying a seeder. Some seeders offer three seed boxes — a main box, plus a small seeds box for seeds like clover and a native grass box for “fluffy” seeds like brome — to accommodate a variety of seeds. Additional boxes can be expensive add-ons; know what you need before making the seeder investment. Additional features to consider are drive options, roller options, ease of calibration, accuracy and capacity. Seeder widths begin at 4 ft and go up from there. Plan on spending about $1,200 per foot on a seeder, considerably more for an over-seeder because of their precision. Seeders are an investment, in most cases too big of an investment for homeowners. Unless you are a seeding professional, the better route might be a rental outlet in your area or check with your local dealer; they sometimes have used or demo units they rent to weekend warriors. Dirt working implements are a must with compact tractors. Not only do they offer their owner economical tools for a host of dirt-related chores — grading roads, maintaining ditches or backfilling around foundations — but they also move snow. Depending on individual needs, every compact tractor owner should own a blade, box blade or grading scraper. Blades are versatile tools with many uses. Box blades easily move large quantities of dirt or rock. Grading scrapers offer fool-proof maintenance of gravel roads. Well-built dirt working implements start at around $600 for a 60-in. blade and go up from there. A final piece, once your stable of implements has grown to include several units, is a quick-hitch. Quick-hitches make hooking and unhooking implements less time-consuming. Most quick-hitches allow hook up from the seat of the tractor with no help from others. Simply back up to the unit, raise your three-point arms and allow the pins on the implement to settle into the receiver lugs. If it’s a PTO unit, shut down the tractor and safely exit to finish hookup. A quality, American-made quick-hitch can start from $200 to $400. You know your tractor will last longer if you perform routine maintenance; implements are no different. Manufacturers offer a suggested maintenance schedule in their operator’s manuals. They are meant to be followed. Check oil in gearboxes, grease drivelines and pivot points, sharpen or replace blades as needed, replace wear items when worn and touch up the paint to prevent rust. With a little care, your implements will last for years to come. Now, visit your local dealer and find the implements and attachments matched to your tractor; buy one, or two or more and get the most out of the compact tractor you invested in. Dee Warren is a marketing manager with Land Pride.